Pangaea Internet development provides analysis, design, and development services that enable our clients to have effective web sites at a reasonable cost. We emphasize our unique blend of technical skills, design ability, publishing knowledge, and creativity. Your site's design can be a catalyst for exploration and discovery  presenting what is unique about you, your product, or your service in a dynamic medium that reaches beyond your physical location. Waste By Rail Incorporated (WBR) provides a comprehensive waste transportation and disposal system linking state-of-the-art, high capacity landfills with the nation's railroad grid. or impossible have now been resolved. Visit the internationally acclaimed artist Susan Dysinger's cyber-display of etching and aquatints, prints and posters, all portraying American Jazz and Blues, in her unique style. Capturing her impressions of her adopted home, the Galapagos Islands, in brilliant color and texture. Visit Sarah Darling's virtual gallery. 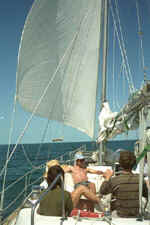 Educational live-aboard sailing programs and adventures for teens and adults on the Chesapeake Bay and in the Bahamas! Sail with Jeff and Liz Armor on Wings of the Morning, their 42-foot ketch rigged sailboat. protected by the palisadoes exists one of the world's finest harbours, your home away from home. European Union, or NOT? Our trilingual, political website exposes the incongruities and corruption of France's favorite little tax-free resort hideaway. Follow our lawsuit against the High Commissioner of French Polynesia. Prometheus aims to heighten the awareness of Galapagos nature and science professionals through education, technology and information resources. Welcome to the world of awnings! Awnings add comfort and originality to even the simplest exterior, and we can help you by creating a unique and distinctive look for your business or residence. Providing medical attention, surgery, and basic necessities such as food and clothing for Ecuador's poorest children and families. Volunteers come to Ecuador to help give these children a chance to live happier, more productive and fulfilled lives. Hotel Ninfa Galapagos, located in the heart of Puerto Ayora, is a pioneer in Galapagos tourism. No one is better equipped or has more experience to help you fully enjoy your adventure on the Enchanted Islands. Copyright © 1999 Pangaea Development, all rights reserved.